Hello lovely people, I hope you're having a great start to the weekend so far. 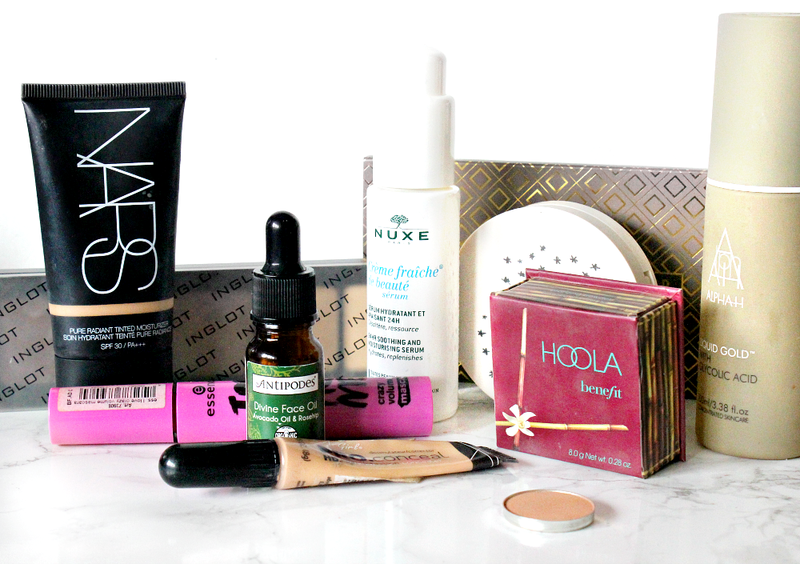 Today I'm going to be sharing the products I loved during the month of February, a real mix of skincare and makeup. I definitely got back into eyeshadow this month, thanks to my giftcard and new additions which have been very exciting, so lets get started! This has been my go-to base of choice in February, mainly because its so quick to apply with just the tips of my fingers and it works really well at evening out the skin-tone too. For an everyday base this is ideal, it covers up discolouration, brightens and leaves a dewy and radiant finish to the skin. Although at first St. Moritz looks a little dark, I find the colour lightens slightly once I'm done applying my makeup. I will say however that as my skin is normal/combo now, with an oily nose, I do always have to apply powder to my nose area if I don't want to look super shiny a few hours later! So for oily skinned girls I feel like face powder would be necessary if you use this as it'll increase longevity too. I love that this base contains SPF of 30, it means I can skip that step in the morning, so if you're usually in a rush when doing makeup and you want a dewy base which evens out the skin, you should definitely try this out! I have definitely re-discovered the L.A girl concealer which took the makeup world by storm last year and I am so glad that I have! It is one of my all time favourites and this particular shade is so perfect for my under-eyes. I find that the slight orange tone when you first apply it, really brightens up the area when blended out. I always have to go in with a corrector shade first (I'll link the review to my current favourite below), however this is one of the only concealers that doesn't crease, shade wise it matches really well and best of all is really affordable! Most of you will know that I love beautyjoint.com for U.S beauty, however you can now order them for a similar price from Amazon which I've linked above, so if you don't want to order internationally there are more options available which is great. I've owned this bronzer for months now, but it's never really been one I've reached for on a daily basis. At first I was obsessed with the Too Faced chocolate soleil, then NARS Laguna and then of course the Kat Von D contour kit. 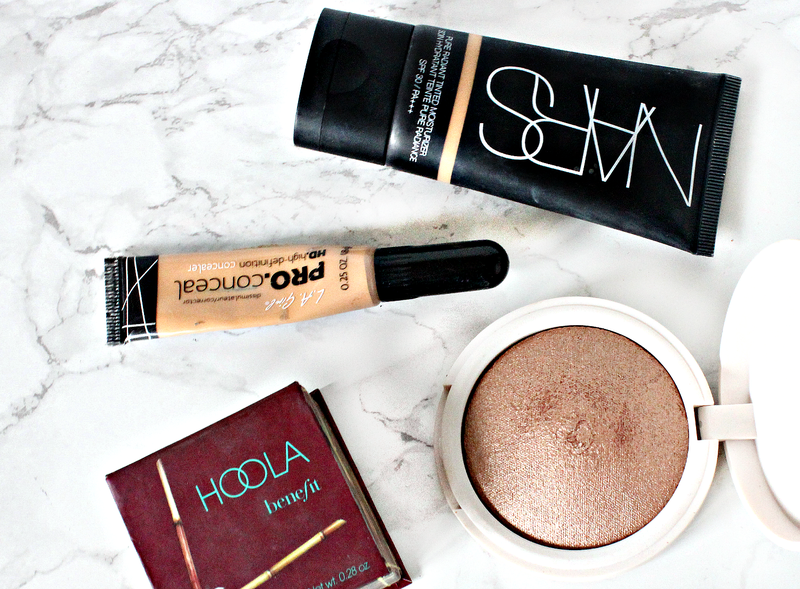 You may be able to tell I love me some bronzer! Of course all of those mentioned products are much loved, but this month I wanted less of a focus on proper contouring and a product which would add warmth and a subtle amount of definition. I totally forgot that Hoola is quite unique, although it looks almost orange in the pan, it actually applies slightly grey toned and it's also buildable! Especially for adding a natural looking nose contour, but also a great all rounder - Hoola is brilliant and works great for light to medium skintones. If there is one thing Topshop do fantastically, it's highlighters! 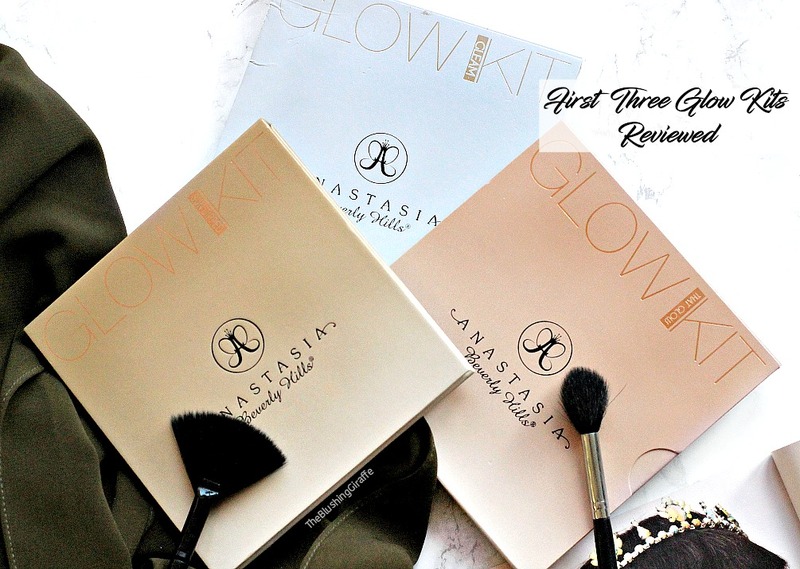 You may know that I adore their glow pots, one of the best cream highlighers I have ever tried (reviewed already). I have had Horizon for a few months, but I was saving it for the summer time as it looks super bronzy in the pan. However it's quite deceiving because although it appears as if it could be a bronzer, it's the most gorgeous rose gold tone highlight with a silver/bronzy mix too. Wow, that has to be the worst description I have ever written of a product ._. If you're Stromboli or darker in skintone, you need to try this out! Don't be alarmed that it isn't the typical champagne/brighter gold colour, because on olive/medium skintones this looks gorgeous and when the light hits there is a slight silver tone which is super flattering. At the same time it's not an in your face kind of highlighter which means I've been wearing it every single day that I've applied makeup and it is BEAUTIFUL. I made this eyeshadow palette months ago and since ordering some MUG shades I have really gotten back into experimenting with shadows again! If you read my haul you will know that I ordered a lot of crease and transition shades, as well as a few base shades. I didn't pick up a highlight/ base colour or my absolute favourite shade of eyeshadows (gold tones) because I already have the perfect ones in this Inglot palette ^_^ The light yellow shadow (313) is literally perfection for every single day because I use a concealer to cover the darkness on my eyelids and I need a bright powder to set it in place. The cooler gold shadow in 155 is probably my most favourite gold I own, it is beautiful and the formula of these shadows are wonderful. They last all day long, the pigmentation doesn't fade and I am so glad that I've put this back into my daily rotation again. 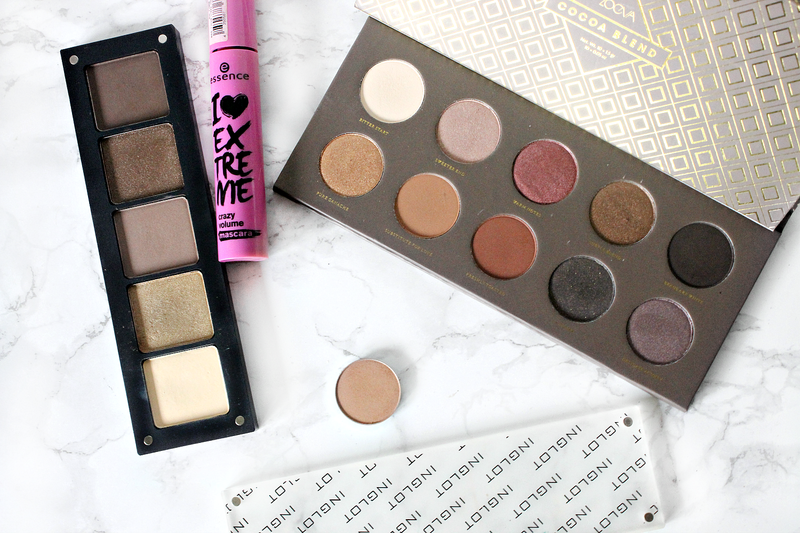 I have been enjoying many of these beautiful eyeshadows, yes they are totally worth the hype! However the shade Creme Brulee has been my all time favourite and the one I opted for everyday, along side Inglot's 313. I have heard countless beauty gurus rave about this shade and I always wondered why...well, let me share this wisdom with you all today! It is a MAGICAL shade, sure it looks pretty boring in the pan, but it literally pulls together any eyeshadow look you create. Adding this to the crease, then popping a couple of other shades on, then using this shade again to blend the whole crease area together...et voila you have an eyeshadow look which appears to have taken a lot longer than it seemed! THIS PALETTE IS WORTH ALL THE HYPE IT GETS. It is officially my favourite neutrals palette, you only need one swipe because the pigmentation is so fantastic. The formula is creamy and each shade is super blendable too. I've swatched a couple of my favourite shades below to show how beautiful they are ^_^ If you've been umming and ahhing about this, trust me and just pick it up, you'll thank me later because the hype is totally real. I cannot sing this mascara's praises enough, it is ahhhhhmazing. Pretty much the perfect voluminising mascara and it costs less than £3 which makes it even more brilliant. Granted it does give slightly clumpy lashes, but that's nothing a decent lengthening mascara can't sort out. I've said before that I'm not really a mascara kind of girl, because it is such a hassle to remove. However I've had this particular one for a good couple of weeks now and it's showing no signs of drying out...so I thought I should get a couple more uses out of it before I throw it away - and this month I've fallen for it all over again. A real must have in my collection for sure. L-R: Inglot 313, Inglot 155, Zoeva cocoa blend 4 swatches, one swipe of creme brulee at the end! I purchased a duo pack of this back in the X-mas sales for an insane price, literally 2for1 and after hearing about this for a few months I couldn't resist that deal! Liquid gold is a chemical exfoliator which has been designed for the treatment and reduction of skin issues such as hyper-pigmentation, age spots, sun damage and scarring. The magic ingredients are the glycolic acid and the liquorice root extract. The very next morning after I apply this, my skin looks brighter and feels smoother too. It also dries out spots considerably and I have noticed a difference in the hyper-pigmentation around my mouth. I need to continue using it consistently for a few more weeks before I write an in-depth review, but I simply had to give it a mention in this post because it has evened out my skintone more than I had expected. (Not quite as much as I want, but I shall keep using it regularly!). Also two weeks ago I discovered a great budget product which has SIMILAR results..watch this space, I may have stumbled across a wonderful alternative! Another bargain from the sales, this serum by one of my favourite skincare brands ever has been a skincare game changer. To be honest for the full price, I would expect nothing less because almost £30 for a serum is pricey for my student budget. The serum claims to provide 24 hour moisturisation, as well as soothe the skin. It is super lightweight, absorbs into my skin easily and it really does make my moisturiser sink deeper/better into my skin, rather than sit on the surface. The weather has been so much colder in February than December/January (so typical *rolls eyes*) and with that my skin has been freaking out a little. This serum went a long way in balancing it out and taking away that horrid tight dehydrated feeling almost instantly. I'm not sure if I would repurchase unless it was on a similar sale, but whilst it's in my collection I will be using it daily. 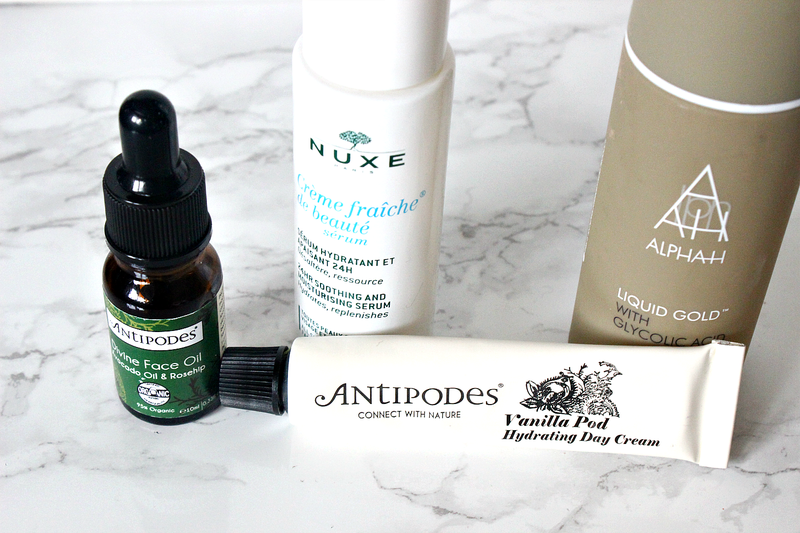 Antipodes is another skincare brand favourite of mine, so when I saw this duo I simply had to pick it up. Like I mentioned in the above paragraph, my skin has been pretty dehydrated so I started using the Divine Face Oil from the start of February. The blend of avocado oil and rosehip oil really do work to hydrate the skin without making it feel greasy at all. I have also been using it now and again to mix with the EX1 foundation which is just a little too thick for my liking. A tiny bit of this oil makes the absolute world of difference, it helps the base blend so much easier and takes away any cakeyness as well as adding a subtle glow! The Vanilla Pod hyrating day cream smells wonderful and a little bit goes a long way too. Again like the oil, it feels light on the skin yet still manages to add a boost of hydration. The size of the products are great too, so I'd highly recommend picking up this kit as the full sized products can be rather expensive. Phew, that post felt like it took an age to write! I'm sure I'm the last person to share my February favourites, so please link your post below if you've written one OR let me know you favourite product from the last month!